It's six years since we last looked at this topic. Wow! So it's definitely time to revisit it. Today we'll discuss a drill that I've quite enjoyed from time to time over the last six months whenever I've had a spare hour or so to "play". It provides practice and learning opportunity in real-time assessment of context and market bias. And like all good practice drills you'll received rapid feedback on your decisions. Skill in timing an entry close to the turning point through recognition of signs that either (a) the context suggests further movement is unlikely, or (b) the nature of price movement suggests that the move has exhausted it's potential. Skill in contextual placement of price targets. Skill in real-time assessment of the ongoing validity of these targets, or the need to amend them. Skill in real-time recognition of danger and the need to either partially reduce risk or immediately scratch a position. Open a five minute chart. 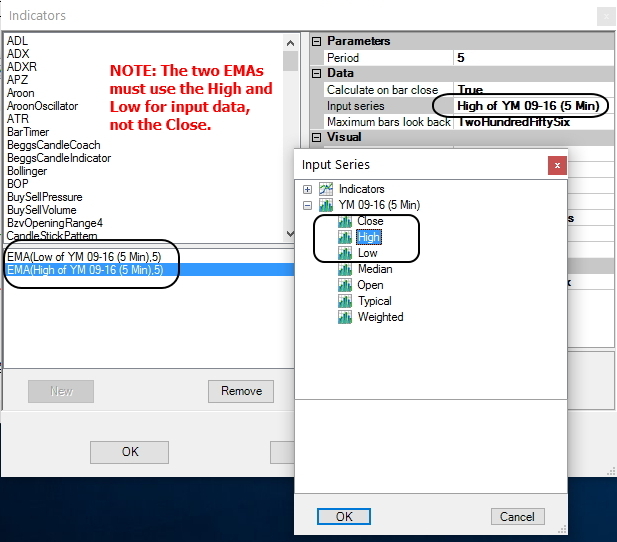 Clear it of all indicators and overlays. Add an EMA(5) based upon the high price (not close price). I colour it green but this is not important to the drill. Add an EMA(5) based upon the low price (not close price). I colour it red but this is not important to the drill. The result is a very tight channel around price as shown in the image below. 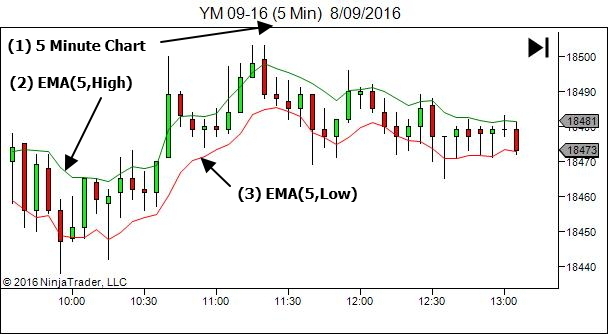 Open your Market Replay application. Select any random date and time. 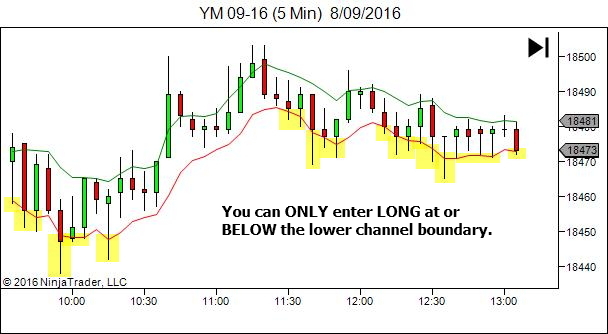 (a) You can ONLY enter trades at or beyond the channel boundaries. 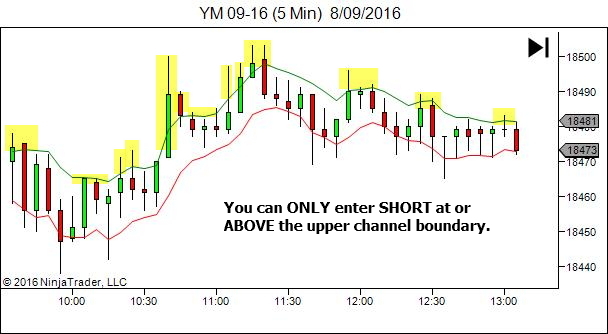 You can ONLY enter short ABOVE the channel. You can ONLY enter long BELOW the channel. (b) EXIT TRADES anywhere you feel necessary in order to both minimise loss and maximise gain. (c) AIM TO PROFIT over whatever series of trades you complete during this drill exercise. 1. By all means examine your usual charts alongside this. 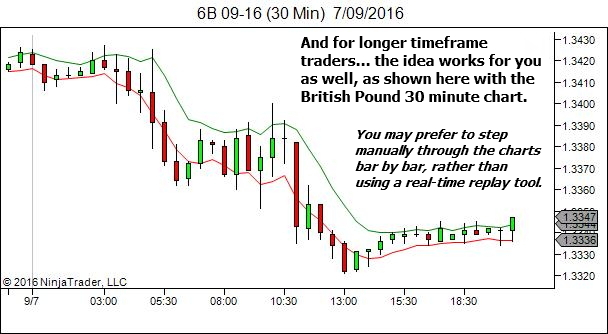 Feel free to refer to your usual higher and trading timeframe charts for context. And your usual lower timeframe chart to fine-tune your decision making. Market internals or orderflow tools are fine as well. 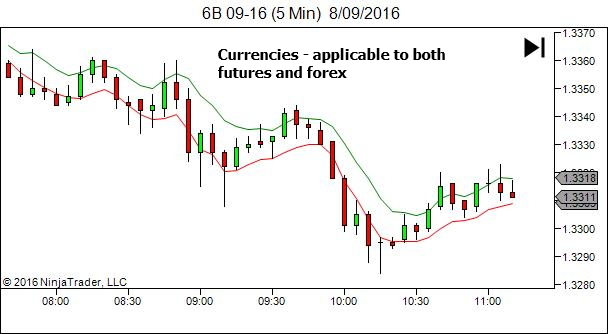 In fact… whatever you normally use for your trading is absolutely fine for this drill. 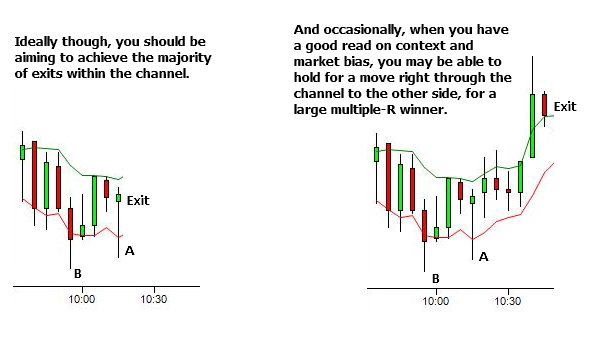 The 5 min EMA channel only provides the limits to the buy and sell areas. 2. I highly recommend speeding up the replay at all times except in the entry zone. For entry, set the real speed so that you can "feel" the movement of price as it would feel in a live environment. 3. You do NOT have to enter on every excursion beyond the channel. In some cases you will miss it anyway as price just tags the channel and moves back away from it. In other cases it would be wise to stand aside, such as fading a strongly directional market. Avoiding a very low probability trade is a good decision! 4. 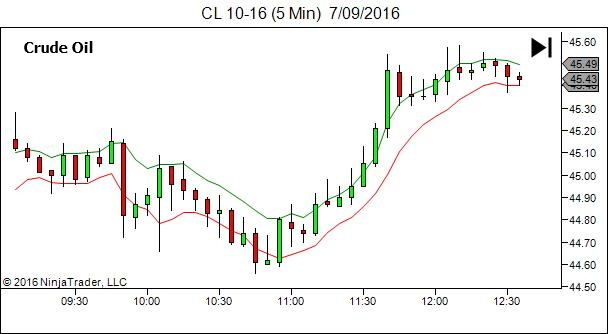 Stop losses – I like to keep this tight in order to practice timing the entry as close as I can to the extremes. I set them at around half the width of the channel. NOTE: Re-entry is always an option if you get stopped out. 5. Remember – the aim is not to profit on every trade. Just like real trading, we aim to profit over the larger series of trades. So take your losses but keep them small. One or two winners should more than compensate for these losing trades. At times this will be easy. At other times, it will be quite a challenge. Your only restriction is that you must enter at or beyond the channel boundary. Ideally with quite a tight stop. Everything else is open to your best judgment, based upon your assessment of context and real-time reading of market bias. Will you place a limit order and let it be hit? Sometimes this will give incredible entries. Other times you will be run over, if you misjudged how far price would extend beyond the channel. Will you wait to see how price behaves beyond the channel before entering at market? Sometimes this will result in a missed trade, when price just tags the entry zone and rapidly moves back into the channel. Will you scale in? Or go all in on one single entry? That's the beauty of the replay tool, allowing you maximum trade entry and management decisions by speeding up the data in-between trade opportunities. And in providing rapid feedback to each and every decision you make. This is not something you will do every day. No-one has time for that. But from time to time when you find yourself with an hour or two available, and a desire to play with some historical price charts, go for it. Nice, I’m definitely going to have to give this a try. 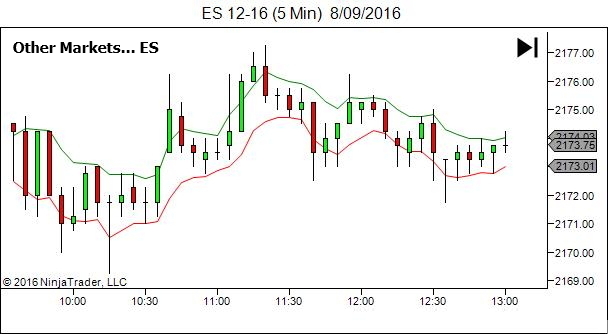 So are we supposed to overlay the EMA’s on the higher timeframe? I’m asking because isn’t your current TTF on a 1 min chart? Also have you ever considered making this process of using high and low EMA as part of your trading style? I like it on a slightly higher timeframe, so that I can use my usual TTF and LTF to influence decision making. Essentially it’s just a “different” structural framework. So to me it’s a higher timeframe thing. But really, the drill is not timeframe dependent. Use it on your TTF if you wish. You’ll just have a whole lot more decisions. And less potential room to profit. So it will be perhaps a bit harder. Have I considered using this for my own trading? No. I’m comfortable with what I do. But for someone who struggles to get entries close to the turn points, and has a problem in chasing price, it’s perhaps something that could seriously consider. It places nice limits on the entry zone. This could help them quite a lot.